SALE! Buy 2 get 1 Free! 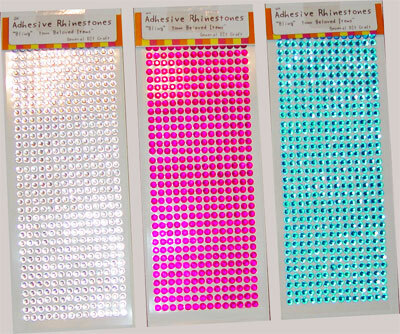 Adhesive Rhinestones Bundle. Beautiful Bling jewels to decorate just about anything! 504 stones per sheet and they are adhesive backed. Just lift off the acetate page and apply! They are glued in strips of 14 but you can easily just snip them apart to use however you want in a row or to use them as singles. Great for crafts, card making, scrapbooking or just blinging up your things to make them unique! Each stone is a little less than 1/4" or 6mm.